With great technology comes great responsibility, or something like that. Perhaps I’m paraphrasing something of greater importance and meaning, but then again so is the film version of Cell. Master of horror Stephen King has lent his stories to multiple different mediums, with an emphasis on film and television. They tend to range from spine-chilling to socially conscious to mediocre. Cell is that rare film that attempts to be a triple threat relying too heavily on its fleeting social commentary, but is only actually scary in how mediocre of a representation the film is to the source material. Samuel L Jackson and John Cusack reunite in another tale from Stephen King’s catalog, but this time with a much less haunting presence and a drastically diminished capacity. The electric chemistry they displayed before is turned down to a murmur as they struggle to create any definition to their dull characters. This does give a chance for characters (and actors) like Alice (Isabelle Fuhrman) and Charles (Stacy Keach) to steal the spotlight and make you wish they were on-screen longer. 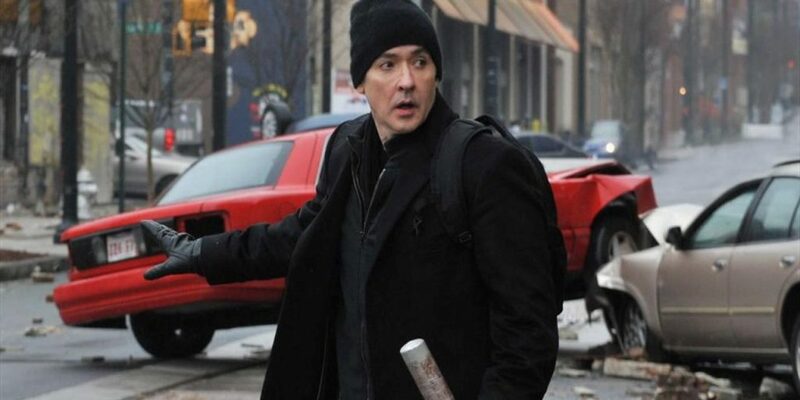 As it stands, Cusack and Jackson’s performances feel spiritless and phoned-in. Much like the ‘phoners’ (cellularly zombified citizens) in the film, Cell is an unrecognizable husk of the Stephen King novel it is based off. Several key elements, such as a structured ‘phoner’ hierarchy and the involvement of psychic abilities get completely scrapped in place for a more “realistic”, melancholic tone. Realistic of course being a relative term considering the whole film comes off as the future you’re grandparents keep nagging you was coming. I could hear the voice of my grandfather grumbling about how this generation are basically zombie slaves to their phones and technology. The film’s recurring social commentary quickly loses steam as it shambles into a somber slow-burn that never really pays off. Cell offers little to keep your full attention so the temptation to find something more interesting on your phone is stronger than normal. The real battle with the film involves it fruitlessly fighting to keep your attention even with every element pushing you towards checking your Twitter. The irony of feeling this is not lost on me, but perhaps the film’s message is less of a warning and more of a self-fulling prophecy.